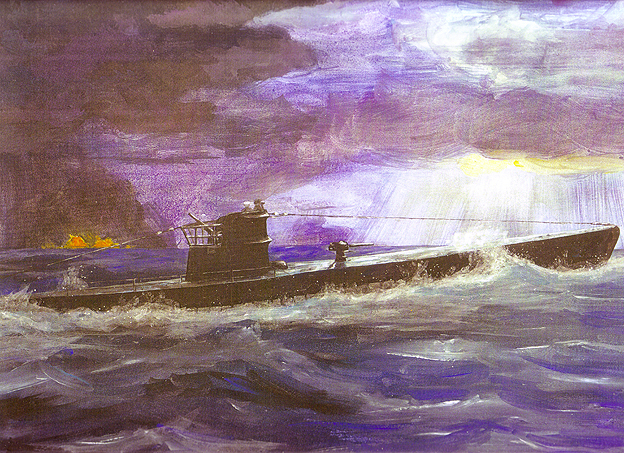 Original picture is watercolour on paper measuring 16� x 12"
There were 1170 German U-boats that saw action during the Second World War. 193 of these were Type IX U-boats and only 2 remain to be viewed today: U505 (a type IXC) is displayed at the Chicago Museum of Science and Technology and U534 (also a IXC) is looking rather forlorn in Birkenhead, UK, having been salvaged from the seabed. The Type IXs were built between 1938 and 1944 and were robust heavy boats. Improvements were incorporated into the design throughout the war resulting in variants of the basic Type IX such as IXB, IXC, IXC/40 and IXD. They were large U-boats compared to their forerunners and were designed for long distance trips. Although frequently used for minelaying duties their size and weight acted as handicaps in coastal areas making them clumsy to manoeuvre. They were much better used as ocean-going vessels and position reports place them as far away as Japan, South Africa and even New Zealand. As the war progressed their fuel capacity gradually increased allowing for even greater distances and, capable of carrying up to 24 torpedoes each, they offered a very real threat to the Allied forces. In fact Eitel-Friedrich Kentrat�s U196 (Type IX D-2) spent over 7 months (225 days) at sea on one trip - the longest U-boat cruise of the Second World War. Other Type IXs immortalised in the history books include Hardegan�s U123 that bashfully launched the first attack on America in 1942 during Operation Drumbeat. And then there is the tragic story of the Laconia. This great passenger liner, converted into a wartime troopship, was torpedoed by Hartenstein on U156 in September 1942. Many of the ship's passengers were Italian Prisoners Of Wars and Allied civilians and as the Laconia sank to the depths Werner Hartenstein attempted to rescue some of these desperate survivors from the sea. Broadcasting his intentions clearly over the open radio band he crowded his deck with survivors. However, a single American Liberator bomber attacked U156 machine-gunning many of the unfortunate survivors. U156 gave up all attempts of further rescue and fled the scene. This particular incident resulted in the order from Dönitz allowing no further rescues to be attempted by German U-boats. After the war Dönitz was accused of war crimes because of the �Laconia order� although he was acquitted at Nuremberg.